As expected on such an old building, the roof needed replacing. 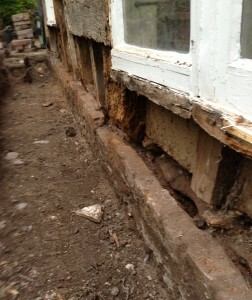 The work commenced, but unfortunately it was found that the underlying structure of the building was rotten. Basically nothing holding up the roof. For many years water has been flowing down the lovely sloping garden and ending up on the back wall of the studio. There is no rain collection, no drain, so over the years this has resulted in rotten wood. Work commenced immediately on the smaller section of the back roof as you can see in the photo. 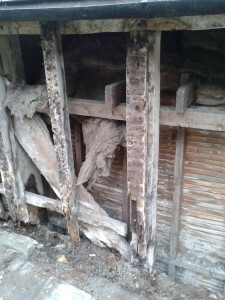 We had to spend £9,835 to get this repaired structurally as well as having the roof re-tiled. The main back section of the roof now needs to be worked on. We need £15,205 to complete the work. To date (16th December 2013) we have raised £14,405.30 from very generous donations from our members. The Chairperson, Paddock Art Studios, Paddock Lane, Lewes, BN7 1TW. Let us know if you wish the donation to remain anonymous or whether you want to be listed in our studio in our “roof savers” list.